What a light and refreshing way to end a meal! Before serving, let it sit at room temperature for about 15 minutes to let it thaw to a true consistency of a semifreddo. This will make 8 servings as shown. Add all semifreddo ingredients to a blender and blend on high until frothy. Place sugar on a small plate and pour liqueur onto a small plate. 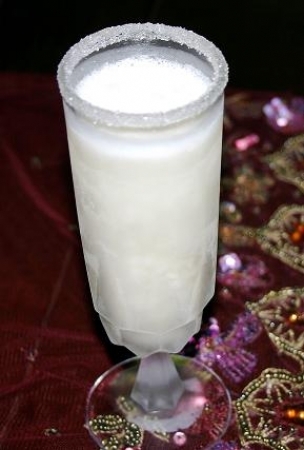 Dip each glass into the liqueur and dip the rim into the sugar moving in a circular fashion until evenly coated. Pour into sugar rimmed glasses and freeze for at least 6 hours. Before serving, remove from freezer and let sit for 15 minutes in order for it to thaw to a true consistency of a semifreddo.